It's summer time and the thing I love more than any thing else is ice cream. The only problem is that I'm planning a wedding and ice cream is not the healthiest option. But what is a healthy option? Bananas! What if you could have ice cream that was made with just bananas and nothing else? Well guess what? You can! All you need are bananas (plus some chocolate powder if you really want to). First chop your bananas into small pieces. Next freeze your bananas for at least one hour. Using an Immersion Blender or food processor, beat the bananas until smooth like ice cream. Add chocolate powder, and blend the bananas until fully mixed, (you can skip this step if you want). Freeze the bananas again until solid. 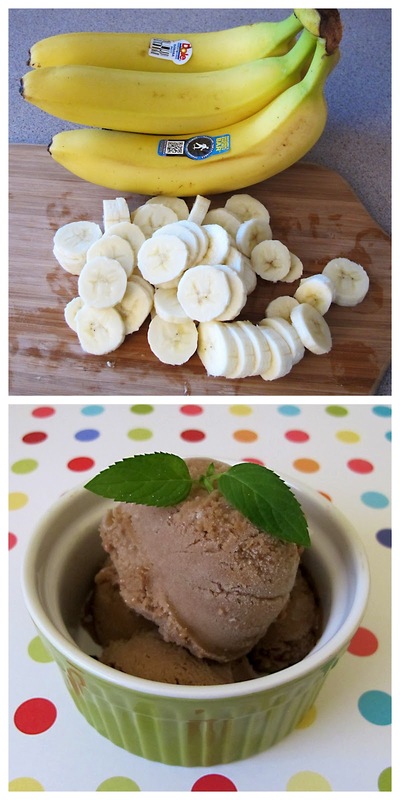 Once the bananas are solid, scoop out and enjoy as you would ice cream. What an intriguing idea for my little one. She loves ice cream and bananas so I'm guessing this combo would be a hit. I personally don't have any kids myself. But i bet you could trick them into thinking it was ice cream, and they wouldn't even know the difference! This is a great idea. I have also given thick yogurt in a cake cone, just like soft serve ice cream, to the little ones and they loved it. It didn't even need to be frozen.